Alireza Jafarzadeh during an NCRI press conference in Washington on 27 April 2017. 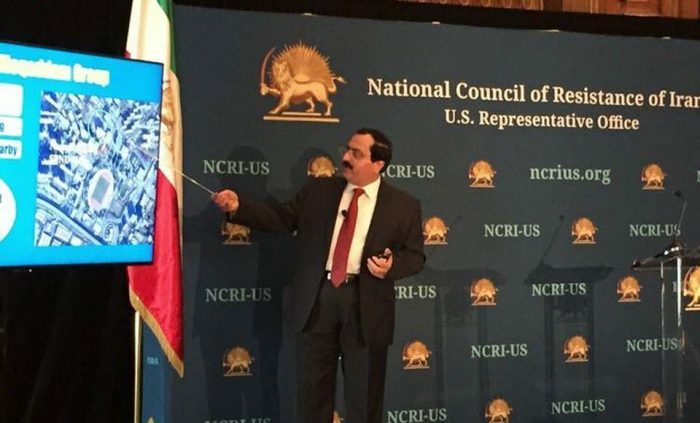 During this conference, Jafarzadeh based on first-hand information exposed the continuation of the Iranian regime’s nuclear activities despite the nuclear agreement by the IRGC affiliated officials in SPND. 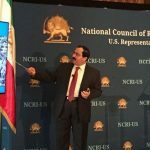 Alireza Jafarzadeh of the National Council of Resistance of Iran penned an op-ed in the Washington Examiner on Sunday, April 21. 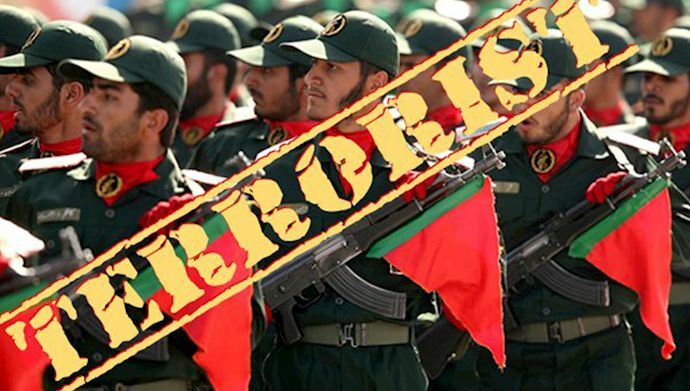 Entitled ‘Iran’s guard gets a long-overdue but much-deserved terrorist designation’, the piece examines the Iranian regime’s Revolutionary Guard (IRGC) and analyses the recent designation of the group as a foreign terrorist organization (FTO) by the US State Department. Jafarzadeh began by welcoming the designation. “This is a major step towards effectively countering Tehran’s systemic use of terrorism as a tool of statecraft,” he said. It must engage in acts of terrorism or retain the capability and intent to engage in acts of terror. It must threaten American nationals or the national security of the United States. Jafarzedah states that IRGC adequately meets these three criteria. “It is the core apparatus of repression, the primary driver of war and export of terrorism, and it runs Iran’s nuclear weapons and missile projects,” he writes. The regime has already demonstrated that it lacks the resources and mechanisms to contain uprisings and public protest. At the tail end of 2017 and into 2018, the MEK-led national uprising quickly spread across all 31 Iranian provinces and hit all of Iran’s major towns and cities. The regime relied on the IRGC’s suppressive tactics to restore order and maintain its grip on power. With the IRGC severely weakened by the FTO designation and with constrained financial resources, should another uprising emerge, the regime will find its vital repressive organ stretched beyond its capabilities? “In short, Tehran is much weaker now than it was a year or so ago,” Jafarzadeh writes. “The foreign terrorist organization designation gives U.S. officials an additional tool for prosecuting Americans who help the Iranian regime,” he continues. But beyond the financial limitations and reduced international support, the designation also scores a major psychological victory over the IRGC. It demoralizes the IRGC forces and their proxies abroad. It shows them that they are not on the winning side. “The designation should also boost the morale of Iranians, who detest the Guard,” Jafarzadeh adds. It will also resonate across the rest of the world. The designation will prompt second thoughts from European companies considering doing business with the IRGC. 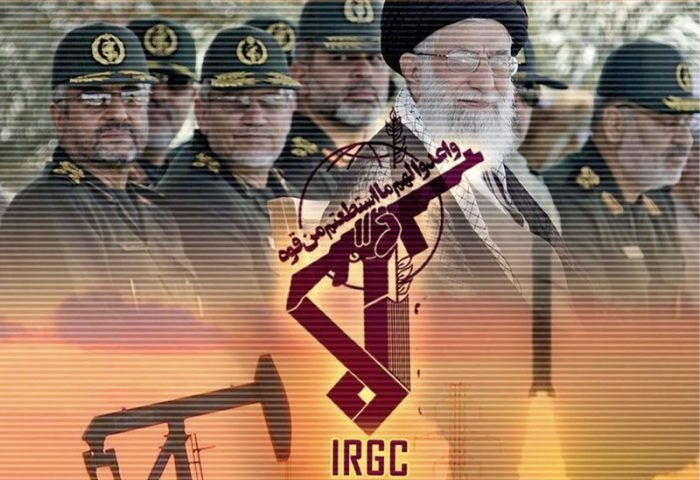 The Books published on IRGC’s terrorist activities inside Iran and abroad by the National Council of Resistance of Iran (NCRI) during the recent years calling for the blacklisting of the IRGC. 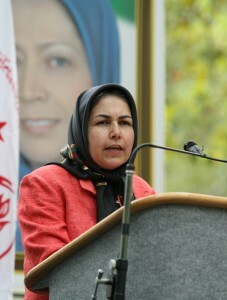 Ms. Soona Samsami, the National Council of Resistance of Iran (NCRI) representative for Washington D.C.
Soona Samsami, the National Council of Resistance of Iran (NCRI) representative for Washington D.C., welcomed the US State Department’s designation of the Iranian regime’s IRGC as a foreign terrorist organization (FTO). The designation from the Trump administration made it unlawful for any US citizen to provide financial assistance, resources, services or advice to the IRGC and its subsidiaries, the Quds Force, Basij Organization, Aerospace Force, Navy and Ground Forces. Previous estimates have suggested that the IRGC controls half of the Iranian economy while 80% of Iranians live below the international poverty line. For Samsami and the NCRI, the next step is to sustain and increase the pressure on the regime’s organs of repression. Beyond the IRGC, the regime has the Ministry of Intelligence (MOIS) which it uses to coordinate international terror attacks against members of the opposition living abroad. In 2018, the MOIS was behind several failed terror plots, in the US, France, and Albania. The most extreme was foiled in June when a Belgian-Iranian couple was detained while traveling to the People’s Mujahedin Organisation of Iran’s (MEK’s) annual Grand Gathering event. The pair had homemade explosives and planned to detonate a car bomb at the event. The MEK has played a central role in exposing the terrorist activities of the regime and its use of the IRGC and MOIS for violent purposes. In books and press conferences, the pro-democracy group revealed the existence of 15 training camps where IRGC forces trained terrorists and radicalized foreign recruits. The MEK also exposed the network of embassies and diplomatic buildings the regime uses to coordinate its terror attacks on foreign soil. The MEK also exposed the regime’s missile development programs, the IRGC’s involvement in wars across the region and its cyberespionage activities. It was the MEK’s revelation that the regime was using sites in Natanz and Arak to develop nuclear weapons that led to the IAEA’s inspection of the sites. This relentless pursuit of the truth and willingness to confront the regime’s violence and brutality wherever it occurs has put the MEK in the regime’s crosshairs. Its members are often the targets of assassination attempts abroad and its event are key objectives for the regime’s terror apparatus. The FTO designation of the IRGC appears to have had the desired effect. Senior regime officials including the Supreme Leader Khamenei and President Hassan Rouhani have made a series of retaliatory threats. In an attempt to boost the IRGC morale, many officials and journalists wore IRGC uniforms last week in a move that drew international criticism and public jest. Samsami outlined her vision for the next phase of pressure. 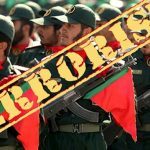 IRGC, Iranian dictatorship’s main force for repression and expansion of terrorism was proscribed by the U.S. State Department as an FTO. Hassan Mahmoudi, a human rights activist and journalist, wrote an op-ed for the Eurasia Review outlining the consequences of the recent decision from the US government to blacklist the Iranian regime’s Revolutionary Guards (IRGC). The terror blacklisting of the IRGC means one of the regime’s most significant repressive organs will be financially cut off. Under the designation, any American individual or corporation providing financial assistance, good, and services, or advice to the IRGC will be considered to be aiding and abetting a terrorist organization and vulnerable to prosecution. The designation was welcomed by the Iranian opposition, President-elect Maryam Rajavi, released a statement of support following the designation. The blacklisting of the IRGC will undoubtedly empower protestors across Iran. Since the designation, Iranians in the cities of Mashhad, Damavand and Pars Abad and across Khuzestan province have taken to the streets to protest the regime’s corruption, increasing costs of living and the inadequacy of the regime’s response to the intense flooding in recent weeks. “These locals are especially angry at the Revolutionary Guards (IRGC) for protecting its own facilities at the price of placing residential areas in danger,” Mahmoudi writes. Elsewhere, supporters of the People’s Mujahedin Organization of Iran (MEK), MEK’s “Resistance Units” have been active in their efforts to oppose regime brutality and violence wherever it occurs. Colonel Thomas Cantwell, a retired military officer and employee of the United States Army who served in both Iraq and Afghanistan, wrote an op-ed for Real Clear Defense calling for sustained pressure towards the Iranian regime. His comments came a week after the White House announced its decision to include the Iranian Revolutionary Guards (IRGC) on its terror blacklist. It is the first time a US Presidential administration has included the regime’s repressive organ on the list of foreign terror organizations (FTOs). Cantwell describes how the decision was emblematic of Donald Trump’s policy of “maximum pressure” towards the Iranian regime. In his speech announcing the decision, Secretary of State Mike Pompeo suggested that the decision would be part of a wider effort to “ratchet up pressure” on the brutal regime. “The president’s announcement correctly identified the powerful, hardline organization as the regime’s primary instrument of terrorism as a form of statecraft,” Cantwell wrote. The IRGC is active across the Middle East. Its troops and resources have been discovered operating in Syria, Yemen and Lebanon. There is not a single conflict in the Middle East in which the IRGC does not have a disruptive, destabilizing influence. At home in Iran, the IRGC is one of the regime’s organs of repression through which it crushes political dissent. Its plainclothes agents arrest members of the Iranian opposition and the People’s Mujahedin Organisation of Iran (MEK) at their peaceful protests. They also carry out torture and kidnapping operations against MEK members. The protest movement within Iran is gaining momentum under the leadership of the MEK. The new designation will severely weaken the IRGC at a time when the regime will need to rely on it to quell protests. The regime’s “actions on the world stage have been indicative of its escalating desperation in the face of the dual pressures of its own people and the international community,” Cantwell writes. This desperation can be increased with sustained pressure from the US and its international allies. For Cantwell, once the IRGC is stretched beyond its means and the protest movement intensifies, the regime will have nothing left to protect it. It will inevitably collapse. Filling the void left by the regime will fall on the MEK’s shoulders. The Iranian opposition President-elect Maryam Rajavi has a ten-point plan for restoring democracy in Iran. It promises Iranians a secular future with an independent judiciary, gender equality, and religious freedom, without nuclear weapons and the death penalty. But to fully realize this dream, the US must tackle the other repressive organs within the regime. The first on the list, Cantwell argues, should be the Ministry of Intelligence (MOIS). The MOIS has been behind many of Iran’s terror plots abroad, including the one last June that intended to detonate a car bomb at the MEK’s annual Grand Gathering event in France. Cantwell finished with a message of hope. “On the other hand,” he writes, “if they do so,… they will critically impede the Iranian regime’s strategy for maintaining its grip on power.” This would signal support for the Iranian public and help usher in a new democratic dawn for the Iranian people. 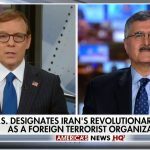 Ali Safavi, from NCRI’s office in Washington D.C. tells FoxNews on the recent blacklisting of the IRGC: “the next step would be to designate the Iranian military intelligence and security, the MOIS, for hatching terrorist plots”. 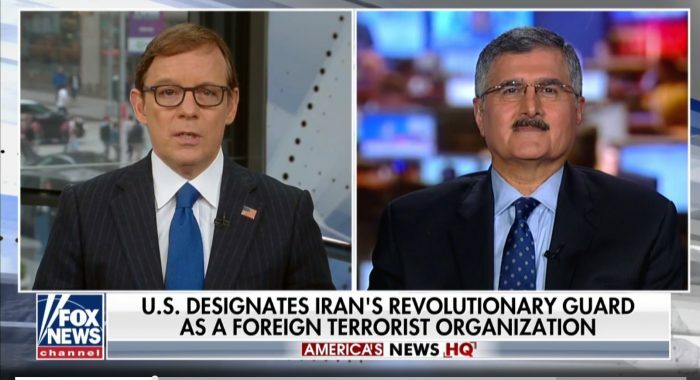 Ali Safavi of the National Council of Resistance of Iran’s (NCRI’s) Foreign Affairs Committee took part in an interview with Fox New’s Eric Shawn on Sunday, April 14. Shawn quizzed Safavi on the State Department’s decision to place Iran’s Revolutionary Guards (IRGC) on its terror blacklist. The move came after the Iranian regime was found to be behind foiled terror attacks in France, Albania, and the US in 2018. One such attack was due to take place at the People’s Mujahedin Organisation of Iran’s (MEK’s) annual Grand Gathering event in Paris. An Iranian diplomat provided a Belgian-Iranian couple with 500g of homemade explosives and instructed them to drive to Paris and detonate the car bomb at the event. They were stopped en-route Paris by Belgian authorities, averting disaster for the more than 100,000 attendees gathered in Paris. He described how the Iranian regime has proven on several occasions that it has no scruples regarding the murder of Iranian opposition members on foreign soil. “They have done it in the 1990s, assassinating the NCRI’s representative in Switzerland… and its representative in Rome in 1993,” he said. 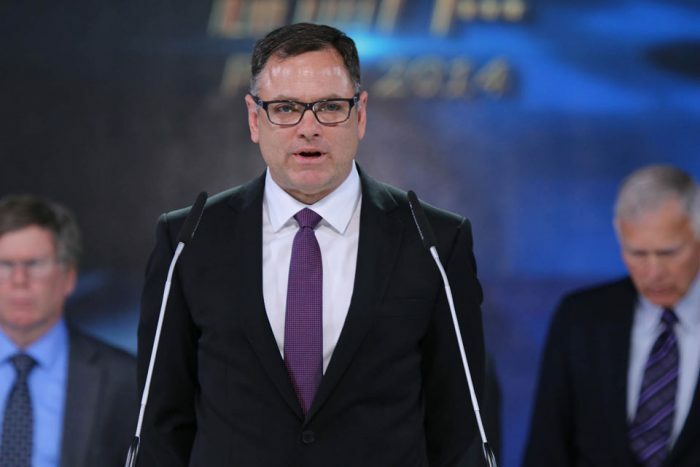 Eric Shawn described how the NCRI’s President-elect Maryam Rajavi has called on the US and other western governments to expel Iranian diplomats and close embassies to deny the regime a footing from which they can coordinate terror attacks. He went on to ask Safavi if he agreed with this approach. IRGC blacklisted for its terrorist activities. US Ambassador Ken Blackwell wrote an op-ed for Townhall urging the United States government to increase its pressure on the Iranian regime in the wake of its inclusion of its Revolutionary Guards (IRGC) on its terror blacklist. President Donald Trump’s designation of the IRGC as a foreign terrorist organization (FTO) was a welcome move that Blackwell argued had “grown more imperative” in recent years. The IRGC is a vital organ of repression for the regime in Iran. It also uses it to export its state-sponsored terrorism across the globe. However, Blackwell asserts, it was the “proliferation of IRGC-funded and facilitated extremist groups in Syria, Iraq and elsewhere,” that meant the US administration had no choice but to take firm action against the group. “Serious critics of the Iranian regime were quick to embrace the FTO designation,” Blackwell writes. Among them was Maryam Rajavi, the president-elect of the National Council of Resistance of Iran (NCRI), and NCRI’s main component, the Mujahedin-e Khalq (MEK). The MEK is the largest and most popular opposition group and has been behind many of the protests that have taken place in Iran over the last 18 months. Maryam Rajavi reiterated the necessity of listing the IRGC as a terrorist organization. She recalled that the Iranian Resistance had declared many times before that the terrorist listing of the IRGC in its entirety is imperative for peace, and security in the Middle East. For the US Secretary of State Mike Pompeo, the designation was vital for cutting off financial assistance and resources to the IRGC from American entities. He made it clear that until the Iranian regime ends its “malign activities” and ends its use of terrorism as a tool of statecraft, it would continue to face economic pressure and restrictions. The IRGC has been instrumental to the regime’s Middle East objectives. Its militia and proxies are active in Syria, Lebanon, Yemen, Iraq, and Afghanistan. 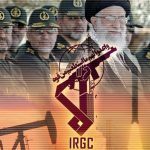 Every cent that flows into IRGC coffers in a cent available to use in devising terror plots, assembling militia and murdering opposition members. But for Blackwell, the designation does not go far enough. The IRGC, for example, was not behind the regime’s international terror plots on European soil. In June 2018, for example, the Iranian Ministry of Intelligence (MOIS) orchestrated a plot to detonate a car bomb at the MEK’s annual Grand Gathering event. The plot was foiled by Belgian authorities, averting countless deaths and immeasurable tragedy. The locals in Ahvaz, rushing to block the flash flooding from damaging their farms, as the government seems not to care about them. Arab News published an op-ed from Dr. Majid Rafizadeh on Sunday, April 14. Rafizadeh is a Harvard-educated political scientist and one of the world’s leading experts on Iran and US foreign policy. The piece, entitled “after the deluge: Iran’s paramilitary looting takes a deadly toll”, criticized the Iranian regime over its response to recent floods and accused it of putting its own interests ahead those of the Iranian people. Rafizadeh highlighted the discrepancy between the information being released by the regime and reports coming from the Iranian opposition. “The official death toll from recent massive flooding in Iran stands at 77, but it is more likely that well over 250 people have been killed by the disaster and as a result of bungled relief efforts,” he writes. In the wake of the flooding, the People’s Mujahedin Organisation of Iran (MEK) revealed that the regime was deliberately withholding accurate reports on the scale of the flood’s damage, including the loss of human life. The Iranian judiciary, under regime control, was reportedly threatening Iranians with prosecution if they spoke publicly on the full extent of the flood damage. “Iranian security forces, the military, and the Iranian Revolutionary Guard Corps (IRGC) are all on the ground in flood-ravaged areas, but are generally more focused on suppressing dissent and preserving the theocratic regime’s reputation than contributing to relief efforts,” Rafizadeh writes. Rafizadeh was not only enraged by the regime’s flood response, but he also accused the regime of contributing to the flood’s damage by mismanaging Iranian natural resources, engaging in unsafe construction practices and neglecting ecological assessments. The regime and its IRGC constructed on land alongside waterways, failed to maintain dams and failed to dredge rivers and lakes to allow for an uninterrupted flow of water. These practices, Rafizadeh argues, exacerbated the flooding and led to unnecessary damage and death. Environmentalists who have tried to raise concerns in recent years have been subject to arrest and tortured. One Iranian-Canadian professor named Kavous Seyed-Emami died in regime custody under suspicious circumstances. Another four environmental activists remain in prison on charges of “spreading corruption on earth.” The charge carries a maximum penalty of death. “Reports indicate hard-liners are presently jostling to exploit the flood damage and further tighten their grip on Iranian commerce and society,” Rafizadeh writes. There have already been reports of the regime moving Afghani, Iraqi and Pakistani mercenaries into flood-stricken areas to quash dissent. 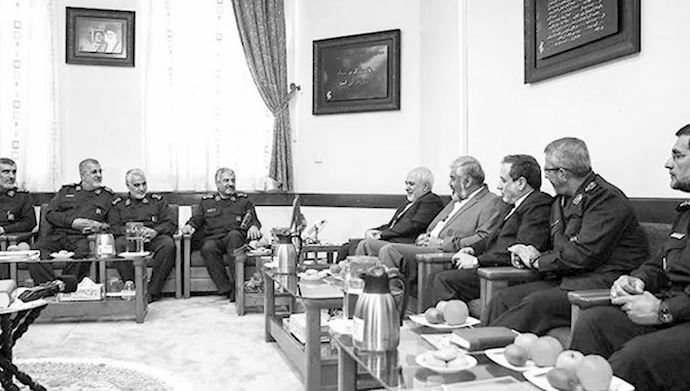 The terrorist IRGC commanders including Qassem Soleimani and Jafari, meeting with the “reformist” Javad Zarif, in the aftermath of the FTO listing by the U.S. state department. 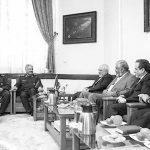 In response to the recent designation of the Revolutionary Guards (IRGC) as a Foreign Terrorist Organization (FTO) by the United States, the Iranian regime’s Foreign Minister, Mohammad Javad Zarif, called a meeting with members of the IRGC’s senior command to discuss how to save face in light of growing alarm over the consequences of the action. IRGC chief Mohammad Ali Jafari and Quds Force chief Qasem Soleimani were both present at the meeting. Zarif ignored the economic ramifications of the terrorist designation and instead focused on a nonexistent possibility of a U.S. attack on regime forces, which he answered with a threat. The FTO designation has thrown the regime into chaos, with various factions casting blame on the others. The Kayhan daily newspaper is closely aligned with regime Supreme Leader Ali Khamenei. Its editor-in-chief, Hossein Shariatmadari, faulted regime President Hassan Rouhani’s “Reformist” faction for the designation in a recent editorial. “When a number of officials launch verbal attacks against the IRGC and question this entity, they are requesting the IRGC and other military units to return to their bases! They consider the IRGC’s presence across the Middle East as useless; the missile era over; the IRGC’s missile tests as provoking the enemy; and despite the deceptions behind the  nuclear deal, they are still not willing to exit this disgraceful arrangement; and are in fact seeking to impose new restrictions through the Financial Action Task Force (FATF) and combating the financing of terrorism (CFT) bills… It’s obvious why the U.S. designated the IRGC as an FTO,” he wrote. Ahmad Jannati, head of the mullahs’ Assembly of Experts, went a different route and expressed his support for the many Majlis (regime parliament) members who wore IRGC uniforms in solidarity with the Revolutionary Guards. Regime Prosecutor General Jafar Montazeri was quick to bring the MEK into the discussion. 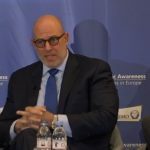 “There’s nothing new in the U.S.’ enmity and we have witnessed America’s enmity in different areas, including its support of the [MEK],” he said. On April 10th, the regime’s Propaganda Coordination Council in Qom Province specifically claimed that the MEK was responsible for the IRGC’s inclusion on the FTO list. Behind all of the infighting and assignment of blame is a deep fear. Officials have not come to a consensus on what will happen as a result of the terrorist designation or how to best address it, but everyone seems to understand that it does not bode well for the regime. Foad Izadi, who is closely affiliated with Khamenei’s inner circle, explained the various options available to the regime. 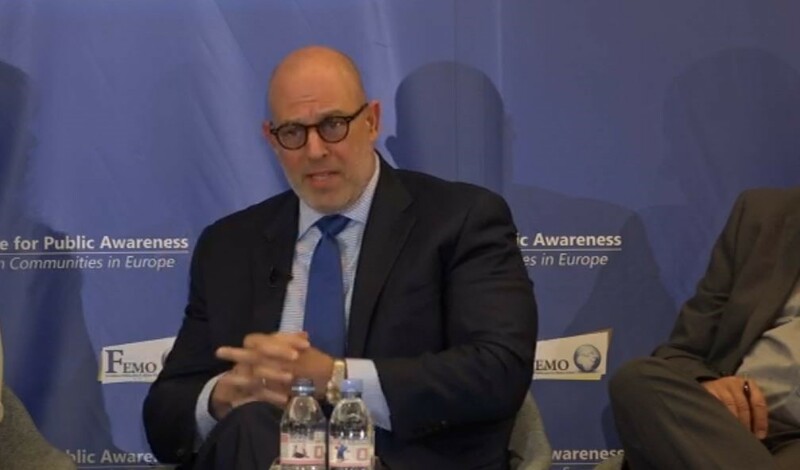 “Considering the fact that we are in new circumstances regarding the IRGC, we are now facing even more difficulties regarding the FATF because the U.S. has a significant presence in FATF-linked entities. What can we do now that they have designated the IRGC as an FTO? If it is approved, we either have to cut off the IRGC’s budget, merge this entity into the army, or have the IRGC personnel fired. We can’t go down any of these paths,” he said. 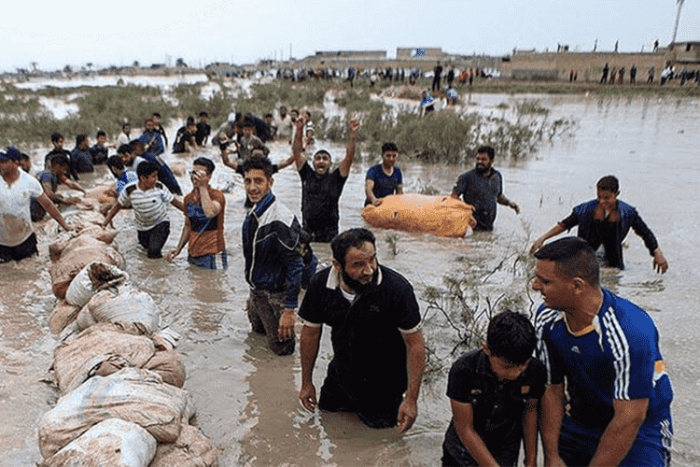 Photo credit to Iran News Wire-The locals in Ahvaz, rushing to block the flash flooding from damaging their farms, as the government seems not to care about them. In the aftermath of a series of devastating floods that ravaged more than 27 provinces in Iran, thousands of survivors say that they have been abandoned by the regime. While the Tasnim news agency and other state-run media outlets continue to report that the Revolutionary Guards (IRGC), Basij Forces, and other regime agencies are providing assistance to flood victims, reports from local residents and dozens of videos shared on social media tell a different story. 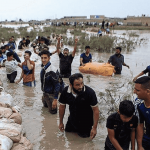 The southwestern province of Khuzestan sustained heavy damage from the floods, leaving numerous people homeless and entire towns destroyed. In one video shared on social media, a man broke down sobbing, saying that he had still not received a tent one week after losing his home. “How much cruelty?! I have been surrounded by water for seven days. They can’t come here and give me a tent?! My sister is sleeping under a tree. Didn’t we participate in the [Iran-Iraq] war to defend our country,” he asked. “Who should I ask (for help)? Whomever I ask, they say it’s not my responsibility. I asked the IRGC, the army, and the Governor. Who should I ask then?! You give me an address to go wherever you say. Maybe I should kill myself. Why am I even alive? !” he cried. Other videos show people in Khuzestan making their own flood barriers bags filled with rice and sand. Locals striving to prevent floodwaters from engulfing their village. Pictures show young men sleeping on their homemade barriers to protect them at night. A video from Lorestan Province shows Iranian Arab women making bread for flood victims in the western province. Lorestan Province was among the hardest-hit by the recent floods, and many villages are still inaccessible by roads. Residents in these areas have still not received badly-needed assistance from the regime, so Iranian youth are walking for hours through mountainous terrain to deliver supplies to their countrymen. The failure of the regime to provide assistance to its people after the deadly floods have led to growing anger among the population. A number of regime officials and state-run media outlets and journalists have expressed concern that this anger could lead to a revolt. Former regime intelligence official and political strategist Saied Hajarian worried that the regime’s failure to provide flood assistance could lead to distrust in the government. 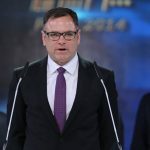 “We have to take note that the crisis of distrust will lead to a crisis of discredit to the extent that people will prefer neutral foreign arbitrators to their Iranian counterparts,” he said. In an April 9th interview published on the Fararu website, “reformist” journalist Abbas Abdi warned that the people were already angry with the regime and that the floods would cause additional protests. “The people are waiting for an opportunity to vent out [their frustration] and what better opportunity than floods and similar incidents,” he added. The Ebtekar daily newspaper, which is closely tied to regime President Hassan Rouhani, wrote that the Iranian people no longer trust state-run media, turning instead to social media for flood-related news. 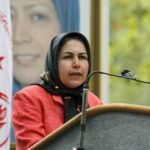 The MEK uses its network inside Iran to share information on social media and the Internet as a whole. This has been invaluable in countering the mullahs’ propaganda and giving the Iranian people the power to access accurate news. The regime has consistently underreported the extent of the damages and fatalities caused by catastrophic floods. Official reports claim that 70 people died in more than 20 days of flooding in 25 provinces. Locals protesting not receiving any state aid days after recent floods. Local reports and eyewitness accounts contradict that number. Several hundred men, women, and children are believed to have died in the floods, mostly in the cities of Shiraz and Poldokhtar. According to Tehran’s Chief of Police, four people were arrested in the nation’s capital for “spreading rumors” about the regime’s botched response to the floods.